Back in 1968, Gibson offered Custom Colored J-45 model guitars in limited runs. I have personally seen, bought and sold examples in Cherry Red, Ebony and Walnut (Brown) colors and all have the cream colored pickguards. This is also the last year of the round-shouldered model as the J-45 & J-50 guitars switched to the square-shoulder dreadnought shape the following year, ending a lengthy body design run that lasted some 35 years. The 1968 Gibson catalog states, "these are Jumbo in sound and craftsmanship, but not cost." This particular era J-45 guitar features an "adjustable bridge," spruce top, rosewood fingerboard, mahogany body and 1-piece mahogany neck construction. 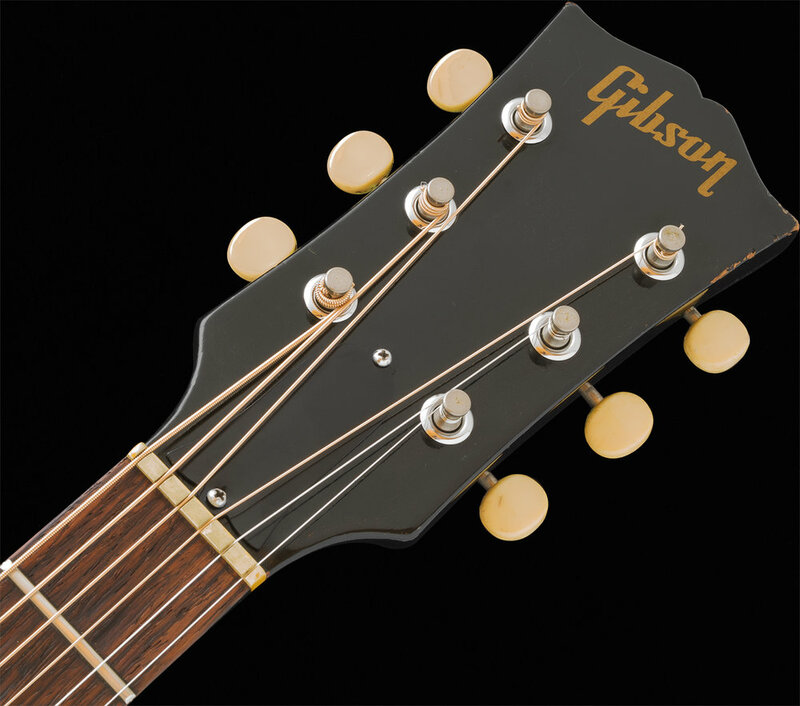 Gibson shipped 3,390 adjustable bridge J-45 models in 1968. Of those, and I didn't locate any color-specific shipping totals, but based on my many decades of vintage guitar retail experience, I feel that perhaps a small run was done in Black. This might account for 40-50 guitars based on what I have owned and witnessed. The flattop J-45 guitars have been very popular since they were introduced back in 1934 and the model has never gone out of production, so I'd say it's been a success! I have examined, tested, serviced and set-up this instrument and found it to be factory-correct and unmolested in every way. The guitar plays very nicely, and the neck is in healthy condition as are the frets. The guitar is nicely preserved, and no one has ever installed a neck heel area "strap button," a personal peeve of mine. 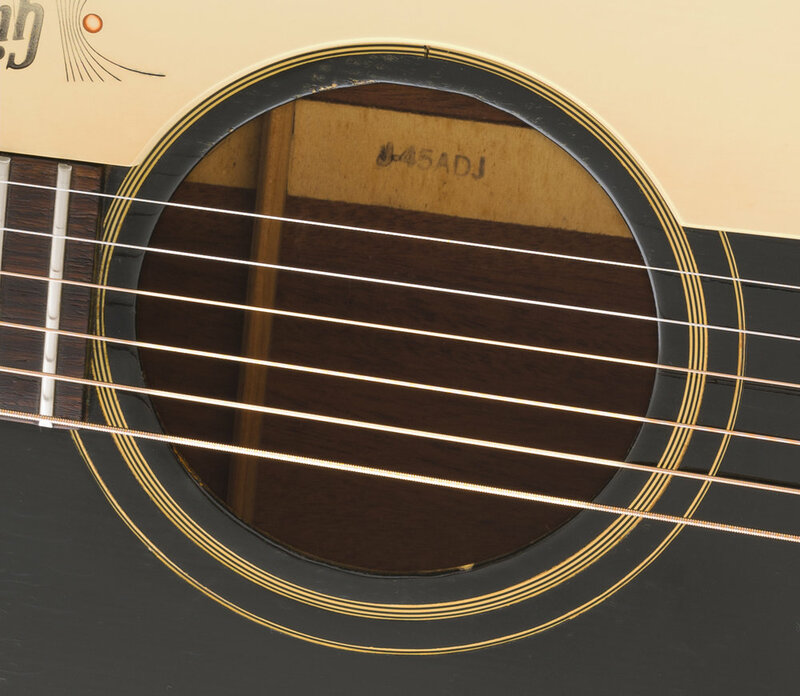 The guitar shows typical signs of wear and light usage, but in a general sense, it is in Very Good cosmetic condition. Globally, there are various small dings, scratches and small paint chips to report. The treble side of the neck has some finish worn away in a few areas underneath and alongside the fretboard (see the photos) and there is a 4.5-inch long hairline crack that radiates downward below the bridge that has been professionally repaired. The surface has not been touched up externally. I opted to arrest the hairline and leave the finish alone and original. I felt that an attempt at any cosmetic work would likely stand out and not blend or match the nicely aged finish and patina. There are no other cracks, loose bracings or any damage. The combination of 50 years of age and a striking Black finish contribute much to the guitars' overall vibe and curb appeal. The CASE is an era-correct original Gibson Archcraft plush lined model with Red lining. These lighter built cases often didn't hold up to the test of time, but due to the lighter usage, this one looks nice and is also in very good condition with a fully-functional handle, latches, and hinges. The guitar has just been set up with D'addario EJ-16, 12-53 Phosphor Bronze strings. I often don't attempt to describe SOUND. I find it challenging and difficult to describe whether or not any guitars' sound is "GOOD." That seems hugely dependent on each players touch, approach, expectations and their own criteria. In other words, if I say that this one really sounds great or is really "rocking" (as many vendors do), I feel it has NO useful value to prospective buyers. Since it's my opinion and I certainly could be biased as the "seller", I believe that only we as individuals can decide if something is to our liking or works for us. So I will spare you the silly-seller hype of which I too don't appreciate reading, I see no value or help in that type of approach. I acquired this beautiful Ebony finished J-45 quite some time ago while running my store. I bought and sold a lot of Gibson flattops during my tenure there. I don't recall exactly how this one made it into my possession, but when it did, I liked the look and vibe of it and decided to hold onto it, the rarity of the finish intrigued me, and I simply liked the unique look of the guitar, that was about 25 years ago. This guitar is now 50 years old and has been safely stored in my collection and has been spared all of the "circulation" that most vintage instruments being offered online today have undergone. If this model appeals to you, you may consider adding it to your collection or throw a mic up in front of it. These seem to be coveted studio acoustic guitars for the way they "sit" in music tracks, as I have been told by my many artists and producer friends. If you have any questions or interest in this guitar, please inquire. Nut Width: 1 9 / 16"
up to $5000.00. Any amount over that and all International purchases will need to be paid via Bank Wire. All instruments have a 48-hour approval which does not start until the instrument arrives to you safely. I only use New, Heavy-Duty shipping cartons and New packing materials. I care about the instruments that I offer as most have been in my possession for 20-30 years. I want my instruments to arrive safely, their continued preservation and Your satisfaction matter to me.